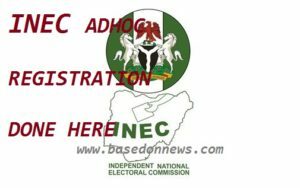 Latest Official Nigeria INEC Job Recruitment Registration Portal 2019, Steps On How to Apply or Register for INEC ADHOC Staff for 2019 Election and work in any state and Local Government Area (LGA) of your choice- Be informed that the 2019 Nigeria Independent National Electoral Commission (INEC) online Adhoc recruitment for Assistant Presiding Officer (APO), Supervisory Presiding Officer (SPO) Recruitment, Graduate Presiding Officer (PO) and Registration Area Technical Support (RATECH) Recruitment is still ongoing for interested and qualified candidates to apply using the application link below. All you need to apply for the INEC Job Recruitment is available below to enable you be among the candidates that would be selected in this 2019 General Election. With the steps below, you can apply and work in any state, LGA or community of your choice. You must not be a political party member. You must not have demonstrated or expressed support for any candidate or party. All ad-hoc staff must apply in person, their group source notwithstanding.